Enigmatic ctenophores are descendants of one of the earliest branching metazoan lineage. Their nervous systems are equally elusive. The lack of convenient neurogenic molecules and neurotransmitters suggests an extensive parallel evolution and independent origins of neurons and synapses. However, the field is logged behind due to the lack of microanatomical data about the neuro-muscular systems in this group of animals. Here, using immunohistochemistry and scanning electron microscopy, we describe the organization of both muscular and nervous systems in the sea gooseberry, Pleurobrachia bachei, from North Pacific. The diffused neural system of Pleurobrachia consists of two subsystems: the subepithelial neural network and the mesogleal net with about 5000-7000 neurons combined. Our data revealed the unprecedented complexity of neuromuscular organization in this basal metazoan lineage. 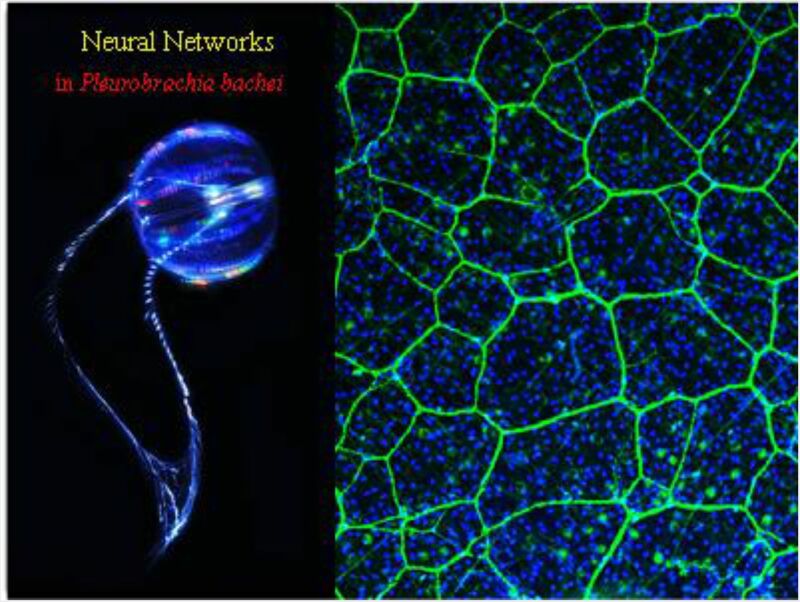 The anatomical diversity of cell types includes at least nine broad categories of neurons, five families of surface receptors and more than two dozen types of muscle cells as well as regional concentrations of neuronal elements to support ctenophore feeding, complex swimming, escape and prey capture behaviors. In summary, we recognize more than 80 total morphological cell types. Thus, in terms of cell type specification and diversity, ctenophores significantly exceed what we currently know about other prebilaterian groups (placozoan, sponges, and cnidarians), and some basal bilaterians. Grant Acknowledgments: This work was supported by the United States National Aeronautics and Space Administration (grant NASA-NNX13AJ31G), the National Science Foundation (grants 1146575, 1557923, 1548121 and 1645219), and Human Frontiers Research Program and National Institute of Health (R01GM097502).